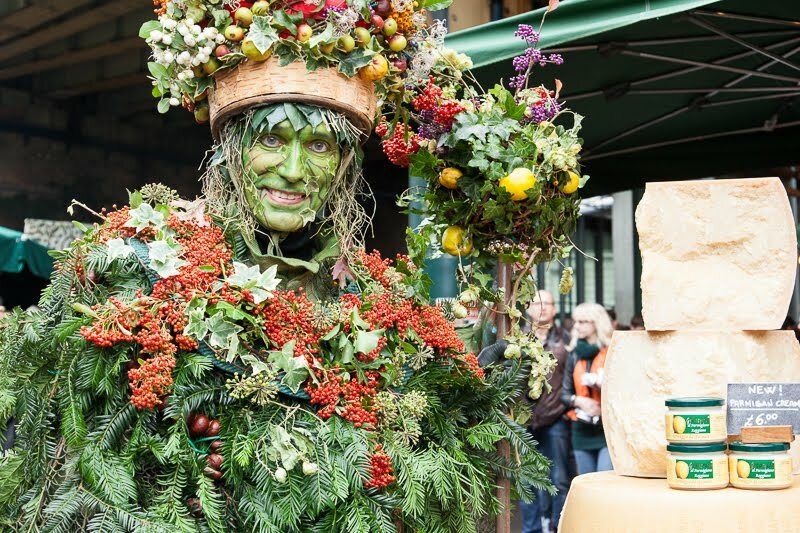 The Green Man was seen at the Harvest Festival in Southwark yesterday. Who is the Green Man and when did he first appear? That I don't know, but he does appear in many cultures and all around the world. It is thought he represents rebirth or regeneration. Hmm what's he doing in autumn then,shouldn't he arrive in the spring. Maybe he is just disappearing again into the woods from whence he came. There are so many tales of the Green Man, one I heard was that he was Robin Hood. What tales do you know? I think he originates from India. Never heard of a Green Man, I don't know the story behind it. But he looks really green indeed. And there was I expecting to see a pic of a pub!! Wonder how long it took him to strip off? I have a friend who collects "green men" of all shapes and sizes. He would have enjoyed seeing him in person. I've talked to a number of medical professionals about this and they tell me he ate too many avocados. Don't know any tales of the Greenman, but I love the image of him mounted in the roman baths in Bath. This green man has a fine costume. I have a few ceramic "green man" masks hanging from the wall of my porch, near the garden. The green man is a pagan concept - how he manages to infiltrate a harvest festival i don't know - well i do know but that would take too long - the concept that he had something to do with robin hood is another case of the hollywood way of burying history in myth although the methodology goes back beyond tudor playwrights. A new character for me :) i like his costume and make up ! Great portrait! Very arty. Now what does the Green Man have to do with cheese? I did a piece once on Jack in the Green, another "green" folk figure. You probably saw it but it's here. His blue eyes are rather startling! One of the very best Green Men I've ever seen!